Msgr. William J. Lynn learned his fate today regarding his bail request pending sentencing. Judge Sarmina sided with Philadelphia prosecutors, who said that Lynn was a flight risk, especially if he left the country to Vatican City which has no extradition treaty. Lynn was requesting to be granted bail and house arrest before his sentencing hearing August 13th on his conviction of child endangerment. The defense proposed that Lynn would also sign an extradition waiver. Judge Sarmina said that was a good gesture, but “worthless.” Lynn's sentencing hearing was moved up three weeks to July 24. He faces up to 7 years in prison. 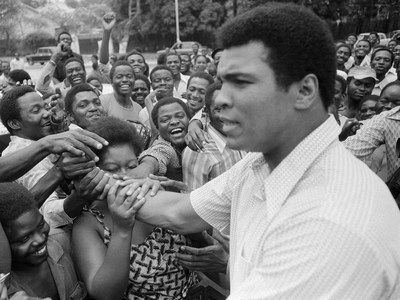 Muhammad Ali has been selected to receive the 2012 Liberty Medal. The National Constitution Center announced this year's recipient of the prestigious honor. The medal is given to “individuals of courage and conviction who strive to secure the blessings of liberty to people around the globe.” Ali is known as a championship boxer, humanitarian, activist, philanthropist, and in his later years, a different kind of fighter, that is one against Parkinson's. The ceremony will be September 13th. This is the 24th annual Liberty Medal award and the 225th anniversary of the US Constitution. A young man in his late teens was shot and killed today around noon. The incident occurred at Amtrak's North Broad Train Station in North Philadelphia at Glenwood Ave. The young man was rushed to Temple University hospital where he was pronounced dead. Trains for SEPTA and Amtrak were disrupted for a few hours while the investigation was going on, skipping by the North Broad station. There are no suspects yet and the name of the victim is being withheld. Tonight, Very Warm, clear skies temperatures in the 90's & upper 80's this evening in Philadelphia.